I was back in the Akinada islands for the second time in as many weeks, doing more research for a new map project on which GetHiroshima is doing some consulting. 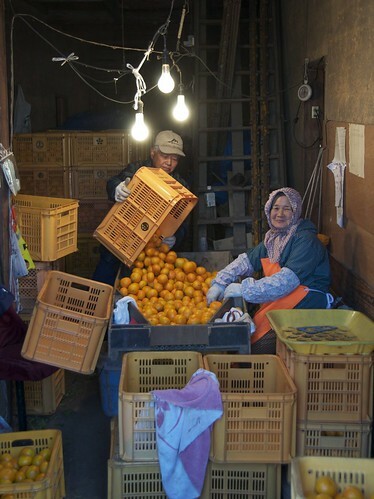 I had a great mooch around the little port town of Ocho (大長) which is best known for its delicious mikan oranges. I took nearly 400 photos throughout the day and though I haven’t looked through them all, I’m pretty sure this will by my favorite. This lovely old couple were not only happy for me to take their photo, but the guy even went and got a fresh crate to pour into the sorting tray. I didn’t want to disappoint them by saying I’d come from Hiroshima when they asked, so I said I was from England and I’d heard about how tasty Ocho mikan are (both technically true).